Charlotte Gray is well known for her histories and biographies of Canada – many of them winning prizes. 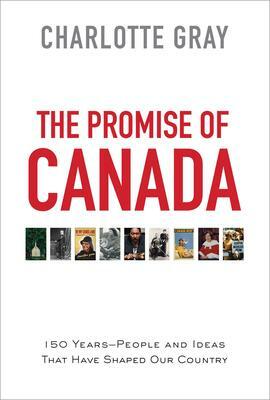 In The Promise of Canada she cleverly chooses nine Canadians from very different walks of life who have left their mark on how we view our country. Beginning with George-Etienne Cartier, one of the Fathers of Confederation, she shows how this shrewd Montreal lawyer insisted on two levels of government for the new Canada: one at the federal level to handle the whole federation, and a more local government in each province that joined up, thus ensuring that French Canada would run everything essential to the survival of their culture. She goes on to describe a very tough Mountie, Samuel Benfield Steele and then seven more Canadians, some more famous than others but all of whom have left their mark on the way we live. These include Tommy Douglas (who master-minded health care), Margaret Atwood with her original-minded writing, Elijah Harper speaking up for First Nations. This is Canada’s 150th Birthday coming up. There will doubtless be much written on how we look and how we got here. This will be one of the most interesting and provocative by a writer, herself an immigrant to Canada who has come to know and love it as her own.